KAJAKI, Afghanistan – Second Lt. Jeff Lenar is a long way from the bright lights of college football at the U.S. Naval Academy, and it took serious discipline to get there. The infantry officer with 1st Battalion, 8th Marines, leads 2nd Platoon, Alpha Company, overseeing Marines in combat who patrol near the landmark Kajaki Dam in Helmand province. Since deploying early this year, he has led his platoon in raids into Taliban-held area and overseen surveillance missions used to collect information about insurgents. His trip there was complicated: to join his fellow Marines, Lenar shed dozens of pounds from his 6-foot-4 frame. He was listed at about 270 pounds while on the team, but now weighs about 220, he said. Lenar, 25, of Marietta, Ga., said he lost the weight in about six months before reporting to officer training at The Basic School, out of Quantico, Va.
“I went into it knowing I had to gain weight, and then that’d I’d have to take it off,” he said of playing college football. As a Midshipman, Lenar provided depth at offensive guard, graduating in 2010. 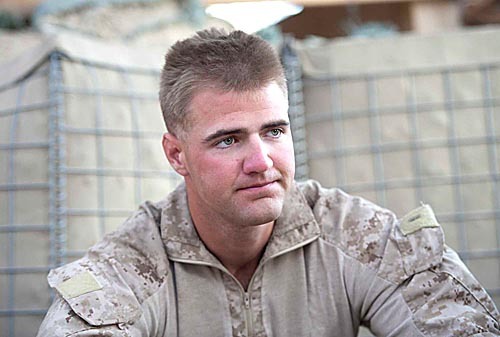 He reported to 1/8 in July 2011, and has been with the battalion since. Pingback: Military Sports Report - After Action – Is Troy Calhoun serious?